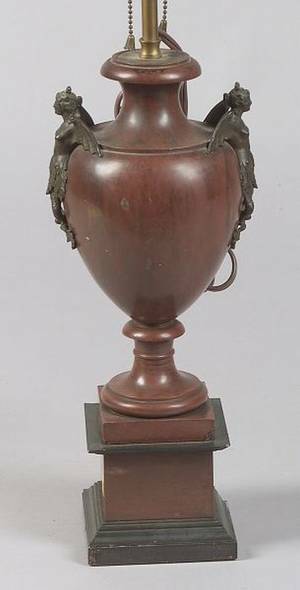 A Brown Marble Painted Urn Form Lamp. On a circular base with ball feet painted with similar design, urn with bronze mounted female figures. Lamp with two light sockets. Without shade. Overall height 28 inches. 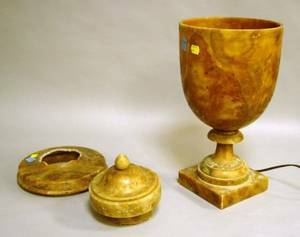 Archived auctions similar to A Brown Marble Painted Urn Form Lamp. 010051: MARBLE URN FORM LAMP & PEDESTAL, C1920, H 52"
080013: MARBLE URN FORM LAMP & PEDESTAL, C1920, H 52"
080260: CHINESE PAINTED PLASTER URN FORM LAMP, H 30"
Incised Brown Onyx Urn-form Lamp. 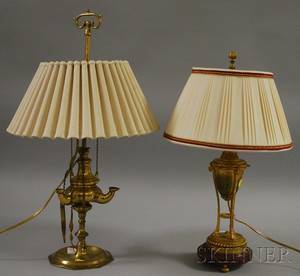 Brass Lucerne Table Lamp and a French Gilt-metal Urn/Table Lamp with Marble Base. 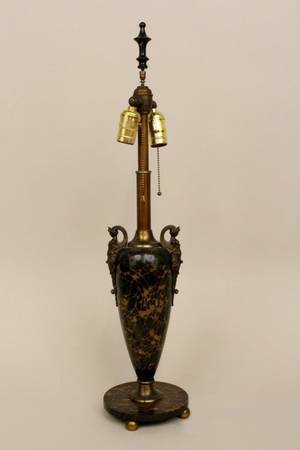 032496: PARTIALLY GILT METAL URN FORM LAMP, 20TH C.